Flower crowns are very popular these days! I love scrolling through etsy to find some pretty ones. With all the holiday costs (christmas outfits, cards, photo session, gifts, etc) I wanted to cut the cost somewhere and figured this looked easy enough to make. Plus, I have not seen any in this style with faux flowers. 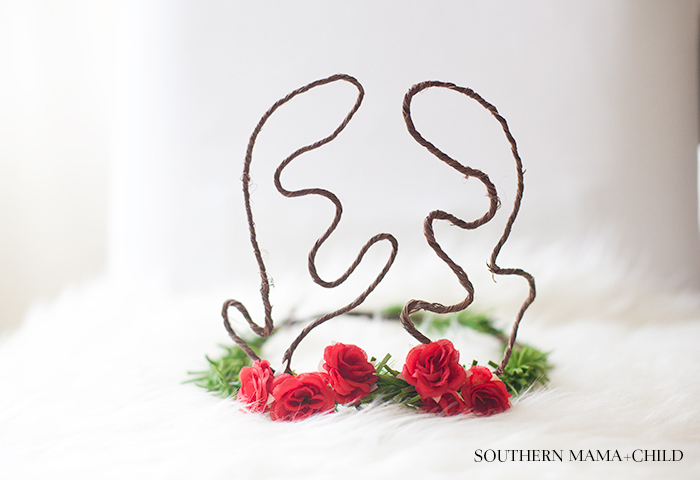 This reindeer flower crown was super easy to make and took me about 15-20 minutes total to create. Luckily I had most of the materials on hand so that helped. PS- Have a boy? Skip the flowers and just use the evergreen florals for a more masculine touch! 1. Cut the vine wire to fit your child’s head. Leave room for a little extra to seal the crown. Twist ends to seal. 2. 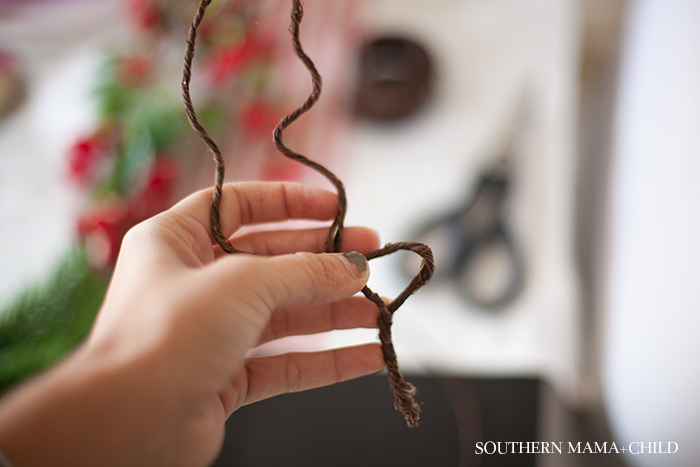 Form your antlers on two separate pieces of wire. I found it easier to lay the vine wire flat on a table and hold my palm over the wire to shape it in place. Be creative. My two antlers do not look the same, and I think that adds character! 3. 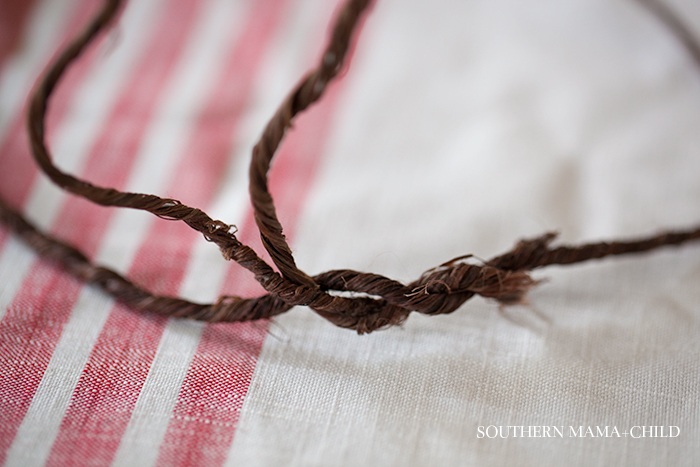 Once antlers are formed, twist them onto your crown like you did to seal the crown together. This is where some wire pliers or kitchen scissors may help if you don’t have calicoes on your fingers 😉 Shape the antlers upright and make sure they are stable on the crown. 4. Take your evergreen florals and start wrapping it all around your crown. As each piece runs out, grab the green wire and wrap it into place going over and under every inch or so. Keep doing this until your crown is covered in evergreen. I overlapped my evergreen florals twice to cover the brown vine. 5. Peel off your flowers (leave a good bit of stem) and wrap them onto the crown with the green wire. Add as many or little as you wish. 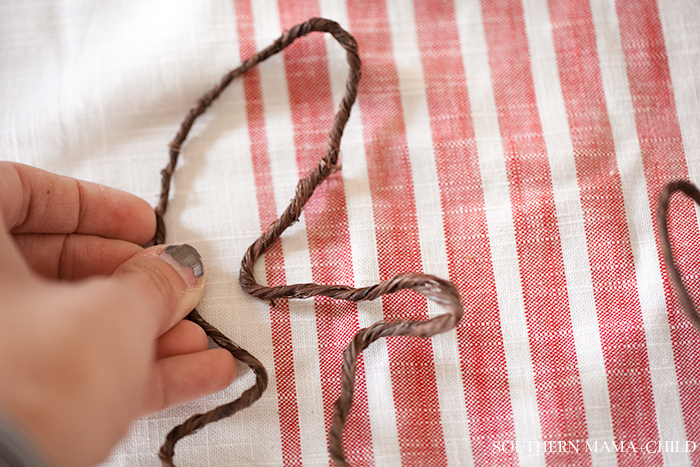 Tie them pretty tightly on there especially if you have a curious toddler! 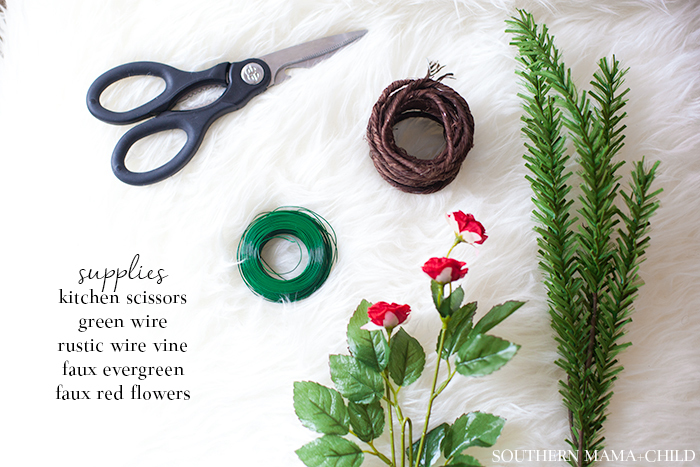 * For little babies or tiny toddlers, I recommend using the floral tape so that you don’t have to worry about the wire poking them if it comes unraveled. I have an almost two year old, so I used the wire. Mold the antlers to the shape you wish. Remember they don’t have to look exact- it adds character! 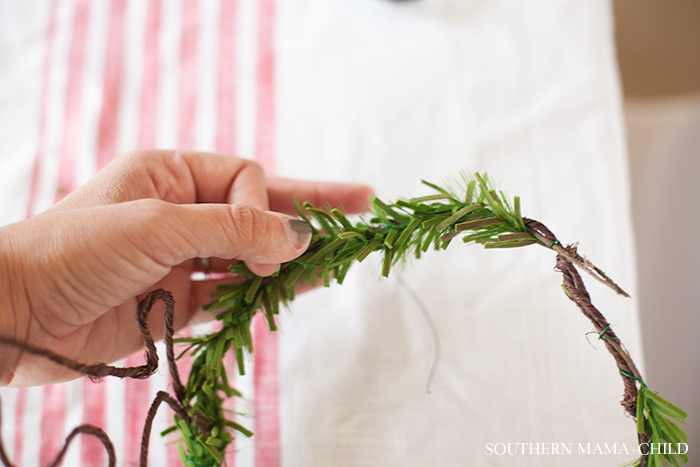 Twist the vine wire under and over the crown to attach antlers. Lay flat to mold your antlers to the shape you wish. Wrap under and over until crown is covered. where can I find the brown wire for antlers?! This is precious! Thank you! 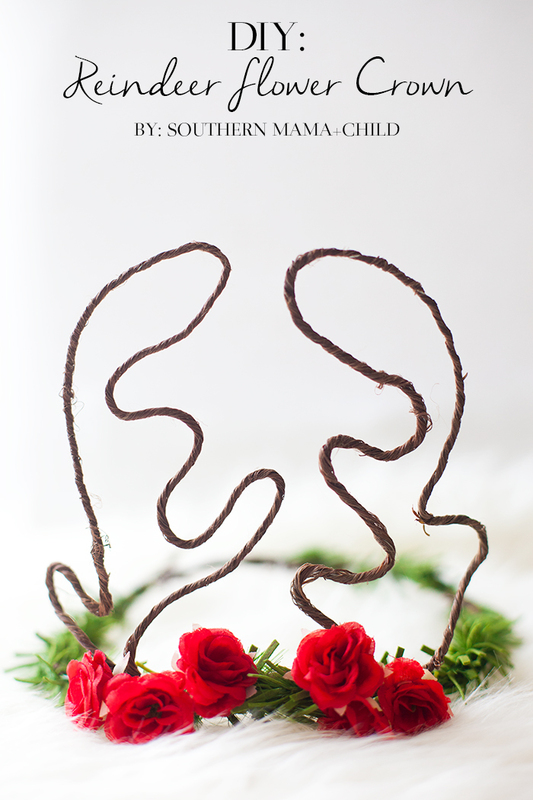 I just made this recently and found the brown wire at Jo-Ann fabrics in their floral area.